The number one sore gum cause is gingivitis, which is an infection in the gums. Gingivitis can become a severe infection called periodontitis if a qualified dentist does not treat it. Periodontitis is a serious gum infection and often requires gum therapy. In the case of gingivitis, sore gums are caused by not cleaning the gum and tooth area well enough. When the sore gum cause is not removed, meaning the gum is not cleaned properly, the gums may become infected. Periodontitis requires immediate treatment because it causes extremely sore gums and can cause long-term tooth and gum damage if it is not treated! Periodontitis is most frequently treated with gum therapy. Gum therapy is also called Scaling and Root Planing, or SRP, and is the best way to eradicate gum disease because it is a deep cleaning process that treats the infection. During Scaling and Root Planing, the dentist cleans deeply between and around the tooth and gum area. 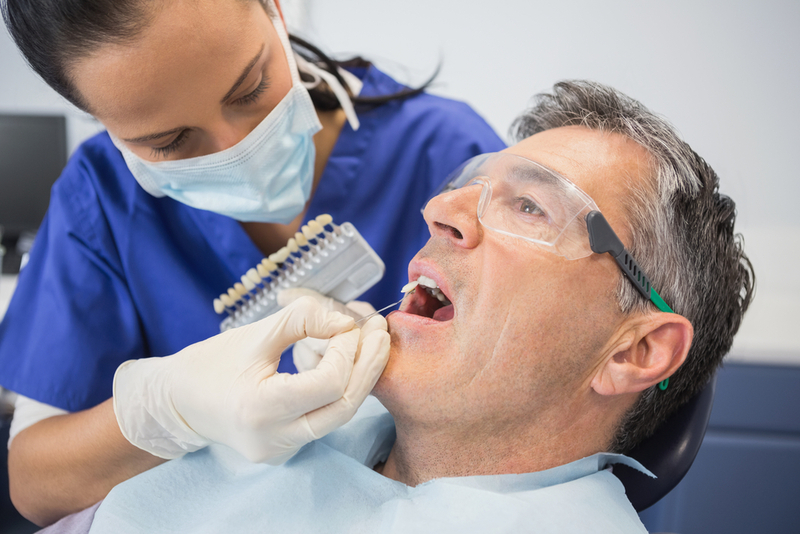 Because this is a painful procedure, it often requires local anesthetic. Some gum diseases can occur without causing sore gums. Plaque buildup around the gums causes some of the tissues supporting and surrounding the teeth to become infected without you taking notice. If you do not notice periodontal disease, it could lead to bone or gum damage, so it is important to get routine dental checkups. Even painless periodontal diseases could potentially require gum therapy, so frequent checking is the best method of prevention. In cases less extreme than damaging periodontitis, sore gum treatment can include simply brushing and flossing more frequently. In the case of a low-grade infection, sore gum treatment can be antibiotics to eradicate the bacteria causing the infection. If brushing and flossing, antibiotics, and gum therapy or Scaling and Root Planing do not get rid of the infection causing your sore gums, then surgery might be inevitable. Other sore gum causes includes tooth damage and cavities. Dental cavities are holes in your tooth enamel and are permanent damage that needs to be fixed. Sore gums are not the only symptom of a cavity. If you have sore gums in addition to a toothache, pain when chewing, and sensitivity to sweets, heat, and cold, contact Vienna, VA dentist, Dr. Priti Naik, immediately. Although cavities do not require gum therapy, they do need to be treated immediately so if a cavity is your sore gum cause, you should consult a local Falls Church dentist right away.